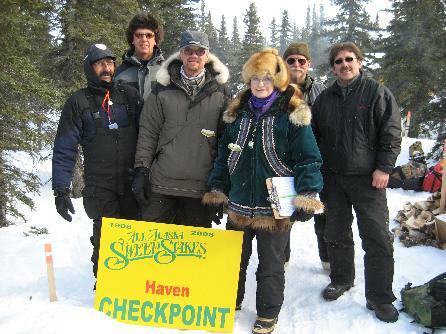 This is part of the group at Camp Haven, located in Death Valley aproximately 85 air miles from Nome, Alaska. 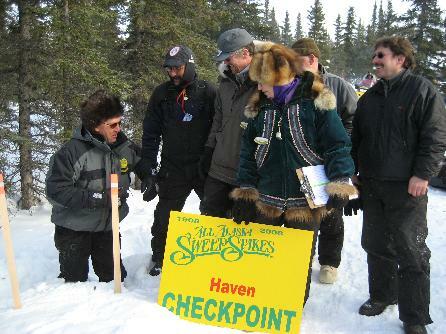 Shown are Donna and Stan Morgan, Judges Chuck Schaffer, Mike McCowan, Al Crane, and pilot Jay Weiler. Basically the same picture, but you can see some from a different angle. There was a lake about 2 miles from camp. Planes would land on the lake, and have to ride a snowmachine to the checkpoint. Portions Copyright © 2008, Ramon Gandia.